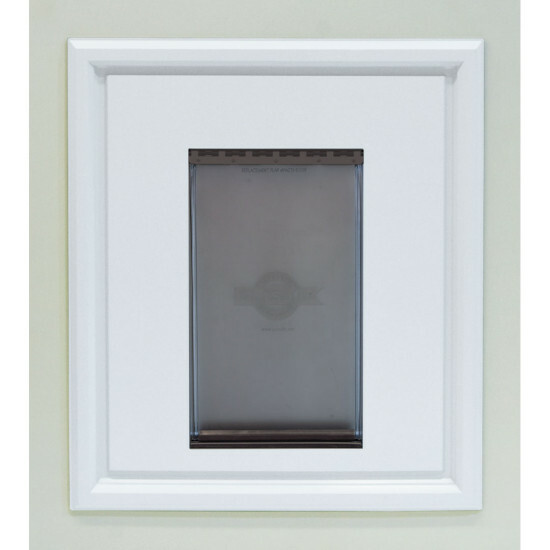 The innovative Panel Pet Door Insert is the first professionally installed pet door specifically designed to fit panel doors. It takes the guess work and frustration out of a pet door installation. No framing materials required! It is designed to complement most 2’ 8", 2’ 10" and 3’ 0" doors with basic 2-panel, 4-panel, 6-panel designs while protecting the core of the homeowner’s door. Flat, metal, fiberglass, wood or glass top doors can be customized with a Panel Pet Door Insert to create a polished and professional look for today’s stylish homes. In addition to the raised mould design, it is paint-ready to compliment any door surface and color. The Panel Pet Door Insert will provide long lasting performance with no rotting, cracking or warping. Internal ribs add strength to withstand everyday pet use. It has twice the protection with an inner and outer frame weather-proof design. The outer frame edges are pre-beaded with Butyl sealant to create a tight seal to resist water leakage and the effects of extreme environmental temperatures. The inner frame edges come together almost seamlessly and its tunnel design prohibits dirt and water damage, protecting the core of the homeowner’s door. The innovative Panel Pet Door Insert is really two doors in one! It offers dual rise options so whether you have a short or tall pet, the Panel Pet Door Insert works for either. It can be installed with an 8" rise for short pets or rotated 180 degrees and installed with a 10 1/2" rise for tall pets. A dual-flap system provides twice the protection from weather and drafts. The flaps attach to a dual-flap mount which is easy to remove for flap adjustments or replacement. Two adjustable hinge plates allow the flaps to move freely to help reduce flap breakage that can occur with heavy or continuous use. 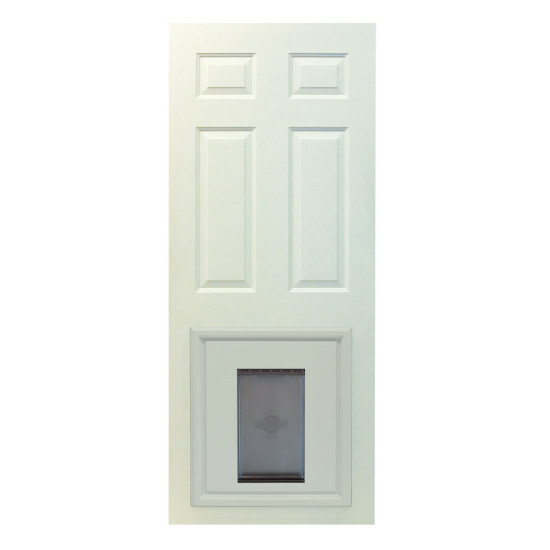 The Panel Pet Door Insert uses limited-travel magnets for a quick flap connection after pets pass through. A snap-on closing panel is included. This is convenient for those times when limiting pet access in or out of the home is necessary. 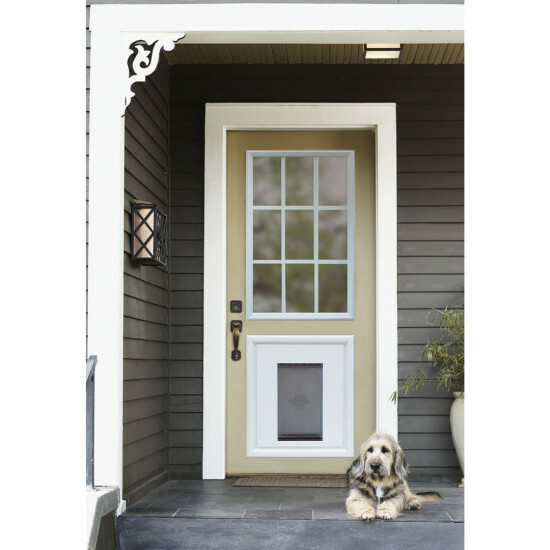 Only the Panel Pet Door Insert can offer a quality pet access system with a polished professional and finished look while giving the family pet the freedom to come and go as he pleases. So relax. We’ll let the dog out! Up to 100 pounds	 10 1/8" x 16 1/2"	 23" x 26 1/4"	 8" or 10 1/2"